Tomorrow at 2pm entries close for your chance to win! 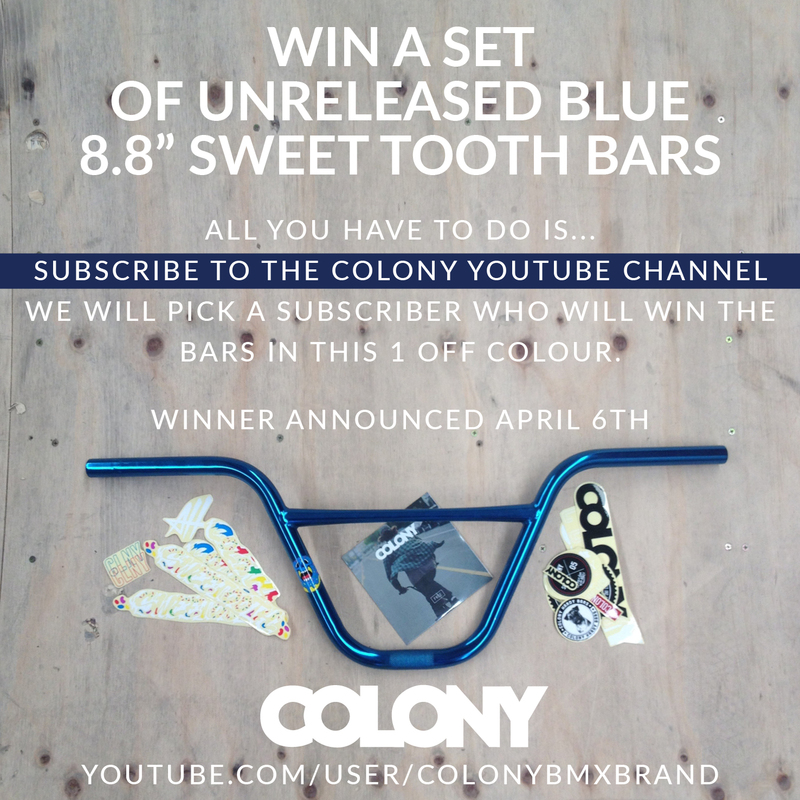 We’ve teamed up with Strictly BMX to give you guys the chance to win this custom Colony Sweet Tooth bike in a one off colourway. To be in with a chance, all you have to do is spend $100 or more at strictlybmx.com and you could be the new owner of this beast of a custom. You could win this custom Colony Sweet Tooth! 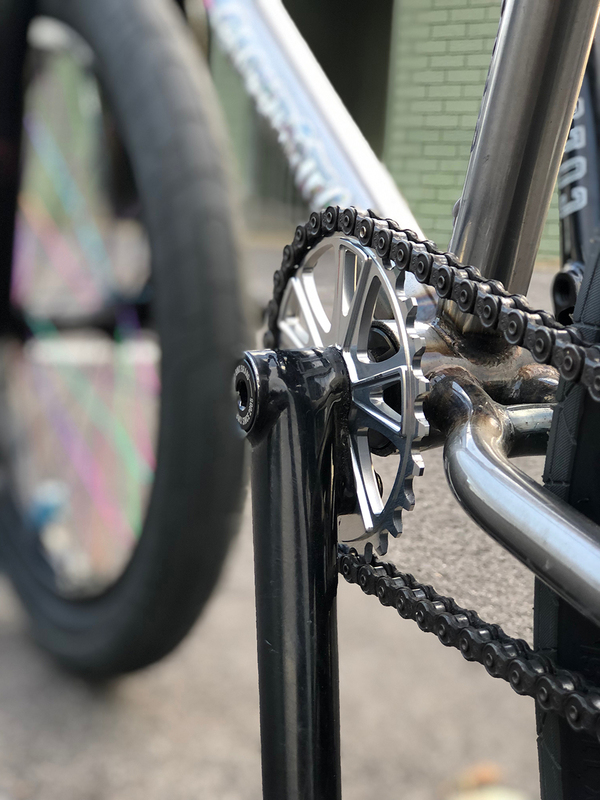 To be in with a chance, all you have to do is spend $100 or more at strictlybmx.com during June 2018 and you could be the new owner of this beast of a custom. Win an Alex Hiam Sweet Tooth frame! 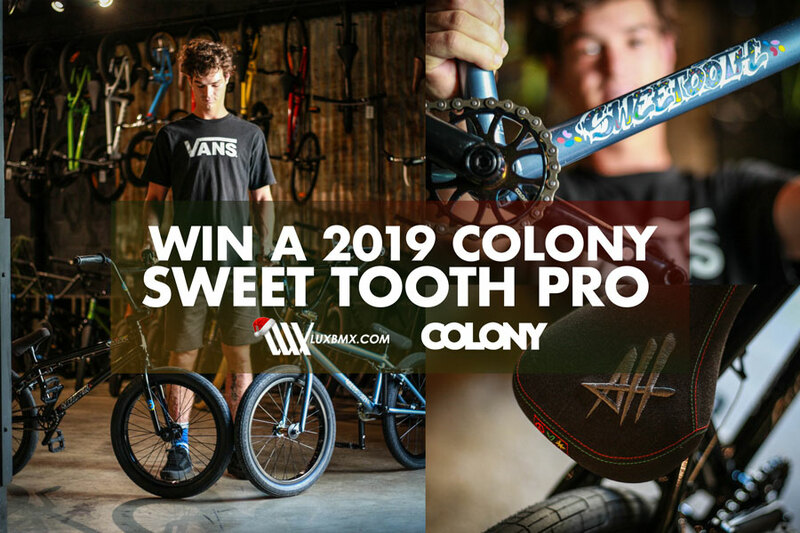 Just like Alex Hiam says, we are giving away a Colony Sweet Tooth frame to one of our subscribers! It’s that simple to enter, just subscribe to our Youtube channel and you’re in with a chance! This giveaway is open to everyone around the world. Winner will be announced January 1st 2018. 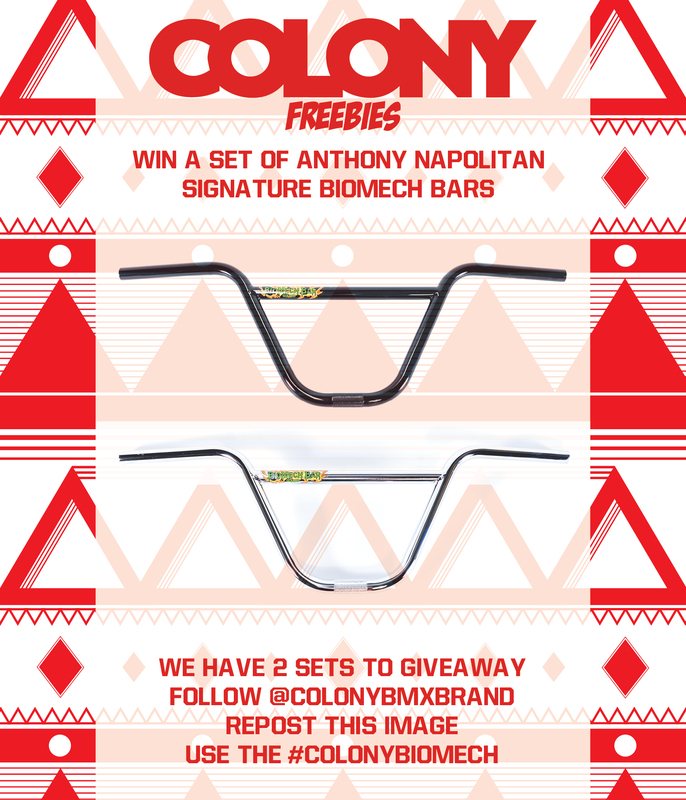 We are giving away 2 sets of Anthony Napolitan‘s signature Bio Mech bars. 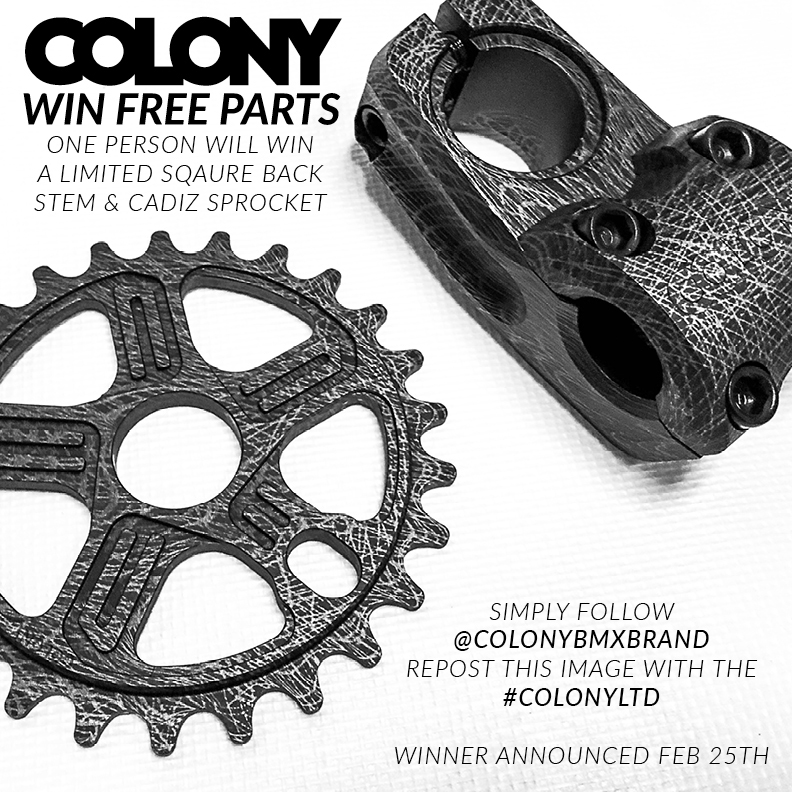 All you have to do it follow Colony on Instagram, repost this image an use the #colonybiomech for your chance to win. Winners announced September 15th. 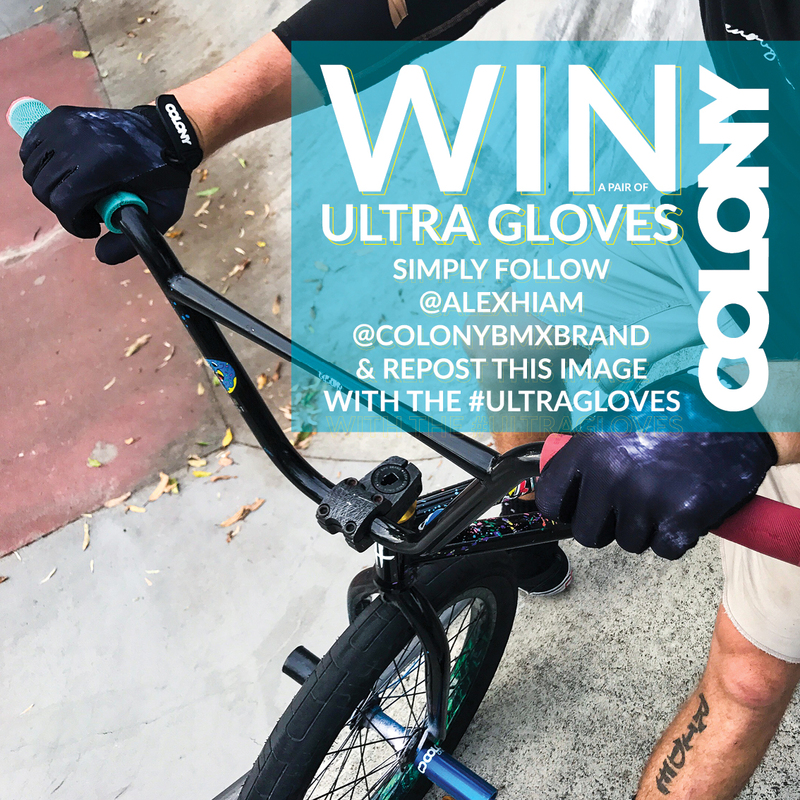 We’ve teamed up with Alex to give away a couple pairs of Colony Ultra gloves. 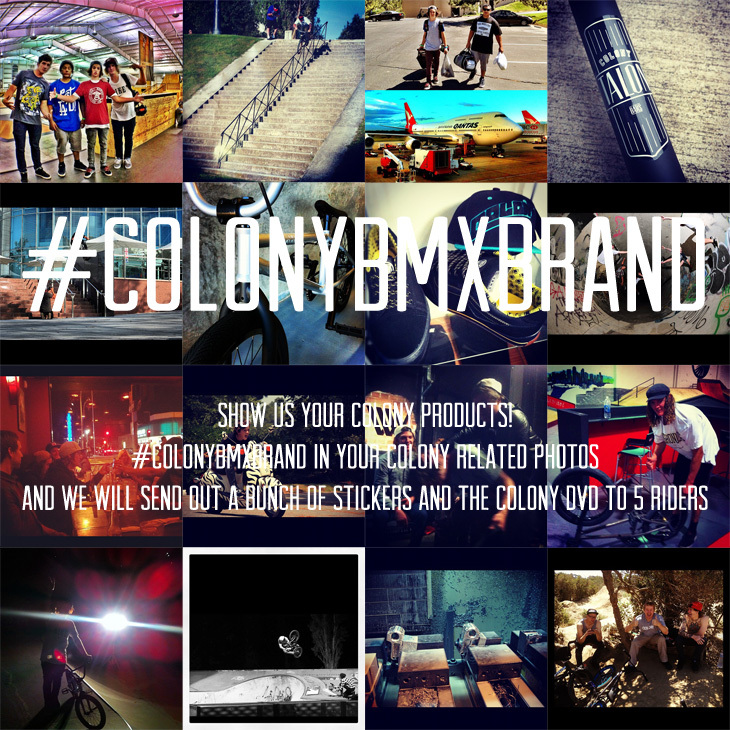 All you have to do is jump on Instagram, follow both Colony and Alex along with reposting the image below. We will be giving away 2 pairs of gloves and announcing the winners in about a week. Win a set of Blue Griplock tyres! 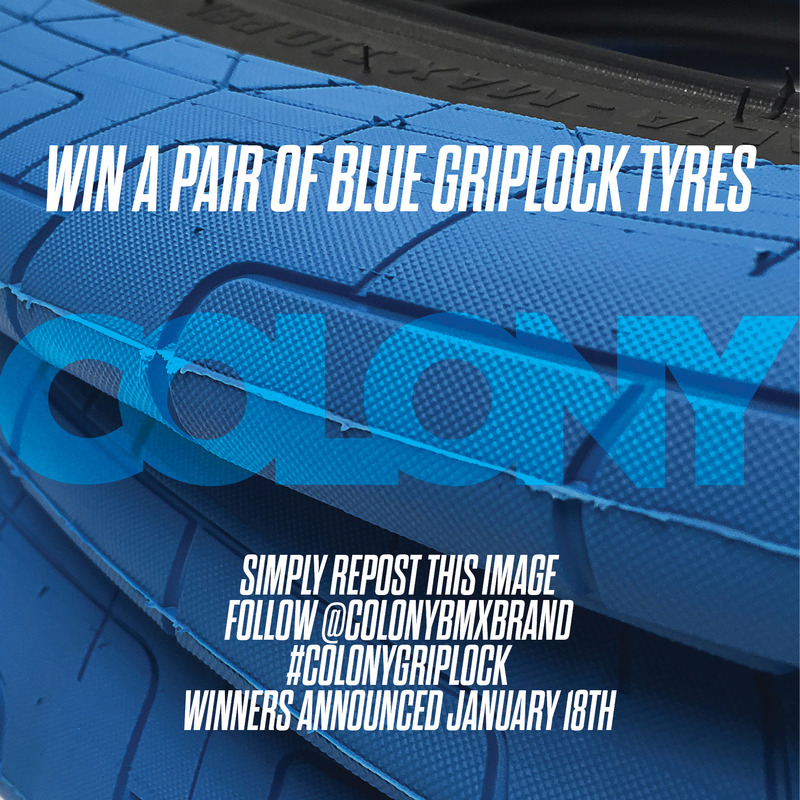 We are giving away a set of Griplock tyres in Blue. 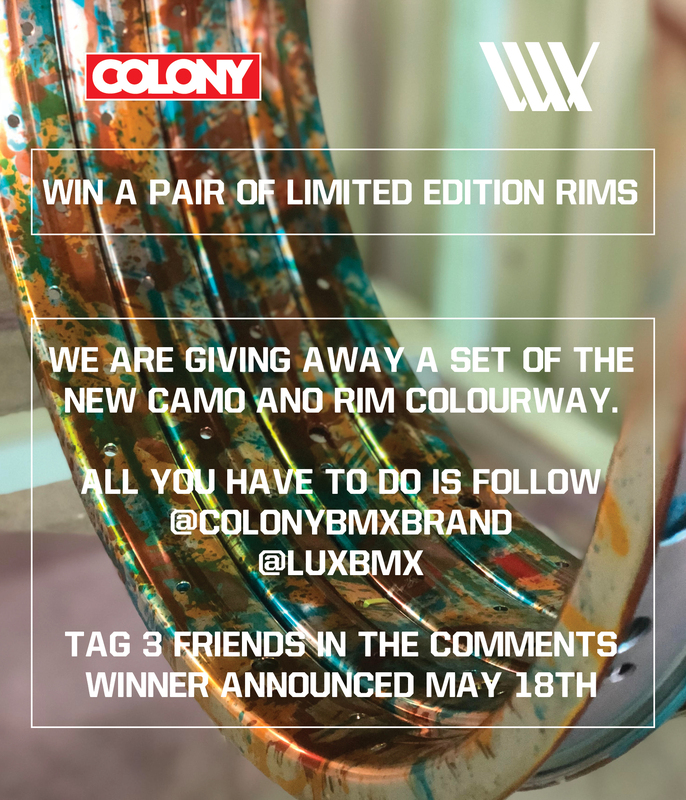 All you have to do is follow Colony on Instagram along with re-posting this image and using the hashtag so we can find you and you could win these tyres. Make sure you follow us on Instagram and repost this image for your chance to win! Victor Salazar wants to give some of you free tires. Watch the video for more information. More info about the Versatil frame can be found here. 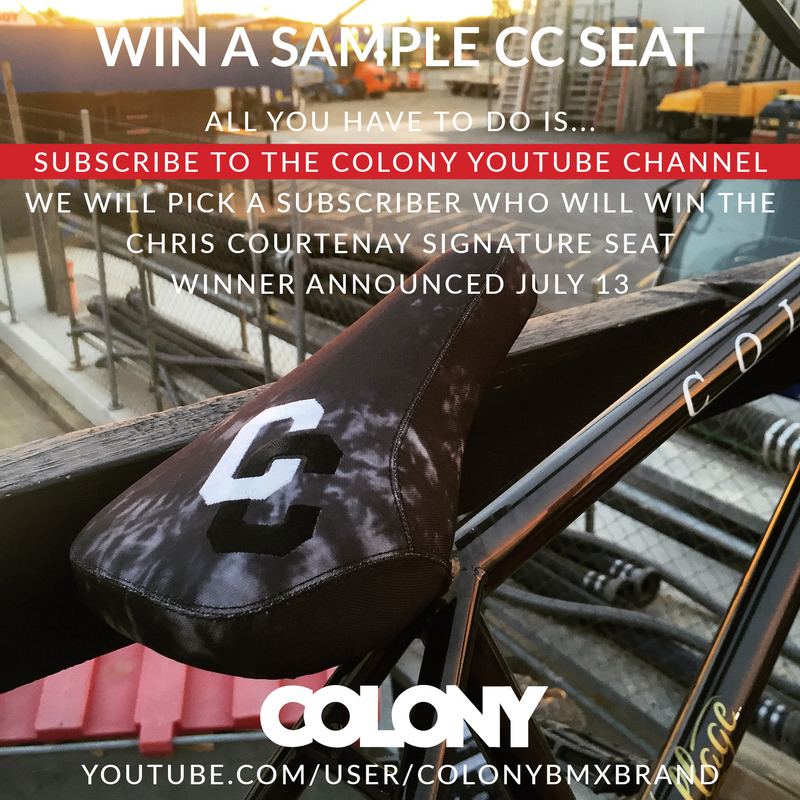 Win a new CC seat! Want to win the new CC combo seat months before they actually come out? All you have to do is subscribe to our Youtube channel and next week we will pick a winner! Subscribe here. 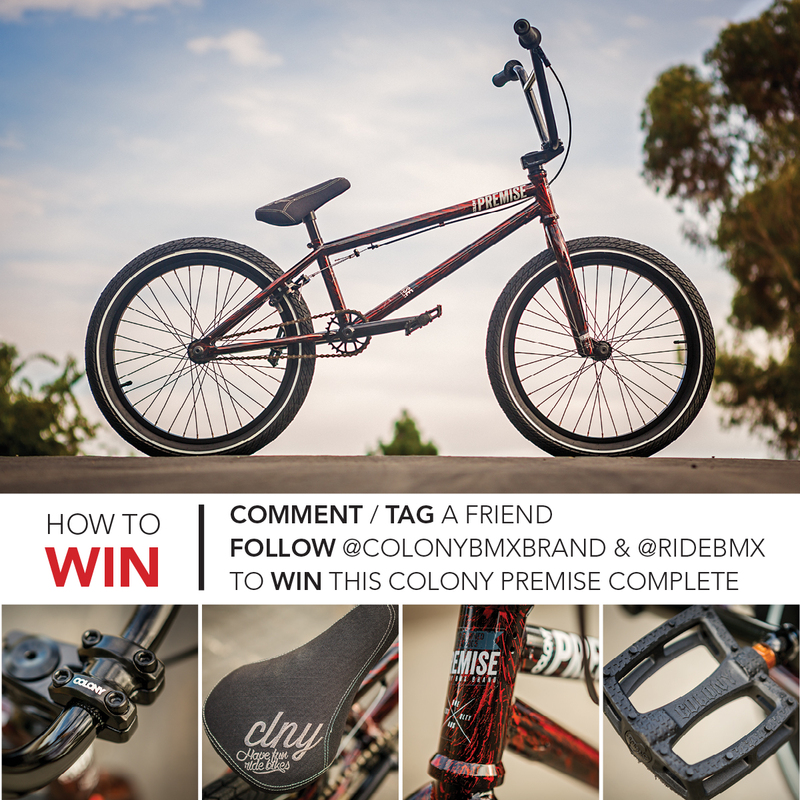 We’ve teamed up with RIDE BMX to giveaway this Firestorm Colony Premise complete bike. 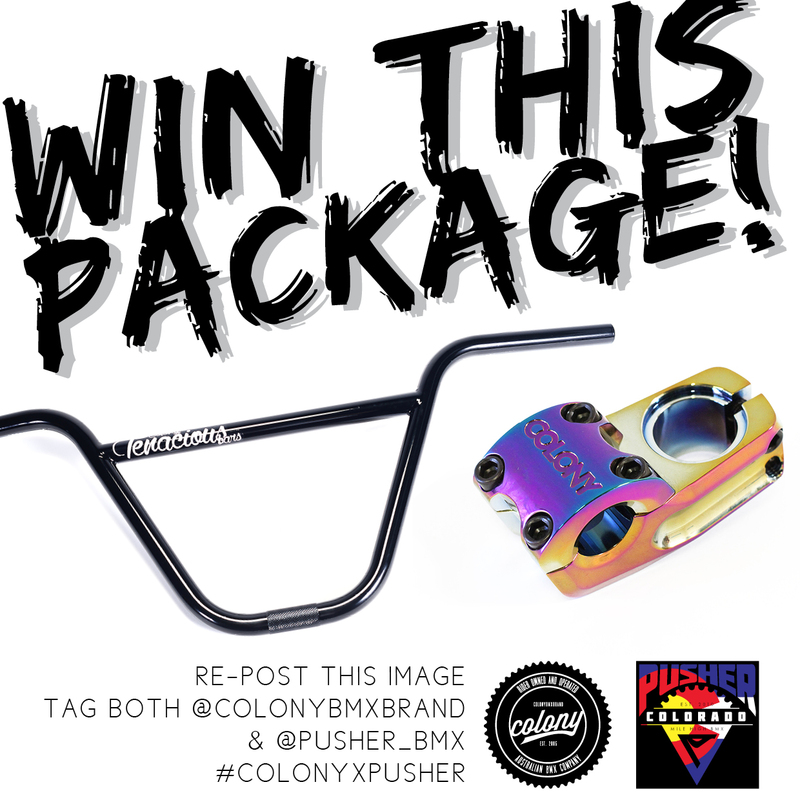 Just follow both Colony and Ride on Instagram and you know the rest… Winner announced in a week. Here’s something special for you guys! We are giving away a 1 off set of Alex Hiam‘s signature Sweet Tooth bars in a sample Blue colour we never released. All you have to do is subscribe to our Youtube channel via this link and we will pick a winner from our subscribers list next week. Simple as that! The Sydney leg & first stop of the 2015 DownUnderGround Flatland Series, is on this weekend in Sydney. 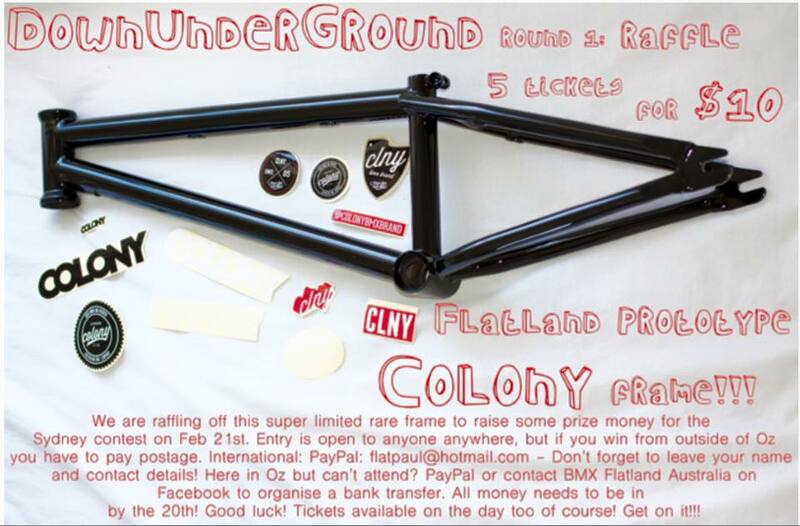 We’ve donated a brand new 2016 Colony EXON flatland frame prototype as a raffle with all proceeds going towards the pro purse. Anyone can won the frame, just buy some tickets. Should be a big day of flatland happenings down in Sydney on Saturday. We are stoked to get behind Crucial BMX Shop in the UK & this VW Car Show with their mini ramp comp going down. Get yourself along for a chance to win one of the very special limited edition Colony Endeavour complete bikes we did with the guys at Type 2 Detectives in the UK. Should be a great weekend of BMX & VW’s for all. We are stoked to get behind Crucial BMX Shop in the UK & this VW Car Show with their mini ramp comp going down. Get yourself along for a chance to win one of the very special limited edition Colony Endeavour complete bikes we did with the guys at Type 2 Detectives in the UK. 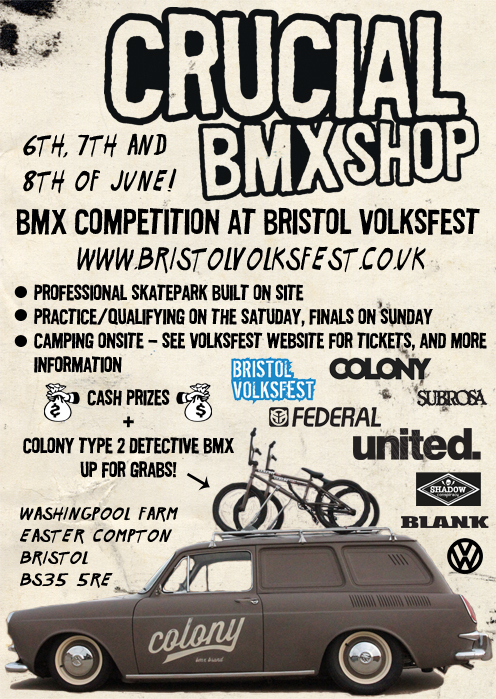 Should be a great weekend of BMX & VW’s for all on the 6th, 7th & 8th of June. 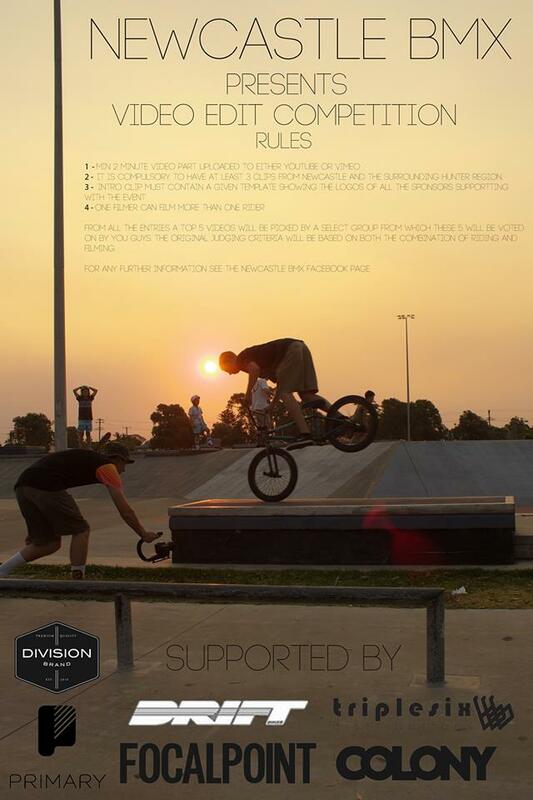 We are getting behind the Newcastle BMX crew who are putting on a video competition for all riders from and around the Newcastle area in NSW. Check the flyer and their Facebook page for all the info. 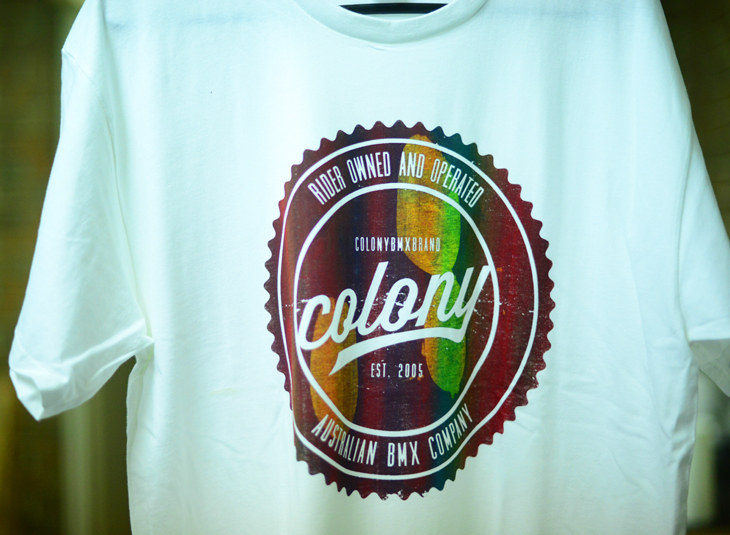 Win a 1 off limited edition Colony t-shirt! As you may know Cooper also runs Focalpointbmx and prints our Colony t-shirts. Well he recently released a limited FP tee that are all one of a kinds because of the print process he uses to make them. While he was printing them he printed up one of each size with a Colony print so we teamed up to do this easy giveaway! All you have to do is like the Focalpointbmx and Colony Facebook pages. That’s it! We will pick a winner for a tee next week sometime and come up with some other ways for you to win one of these very special t-shirts. A very special issue number 48 for those that know. The new 2020 magazine will be out soon so keep an eye out for it. Action packed with coverage of our recent #followthelinestour from Rocky to Canberra & everywhere in between plus you can win a 2014 Sweet Tooth frame, how cool is that? Check it out. 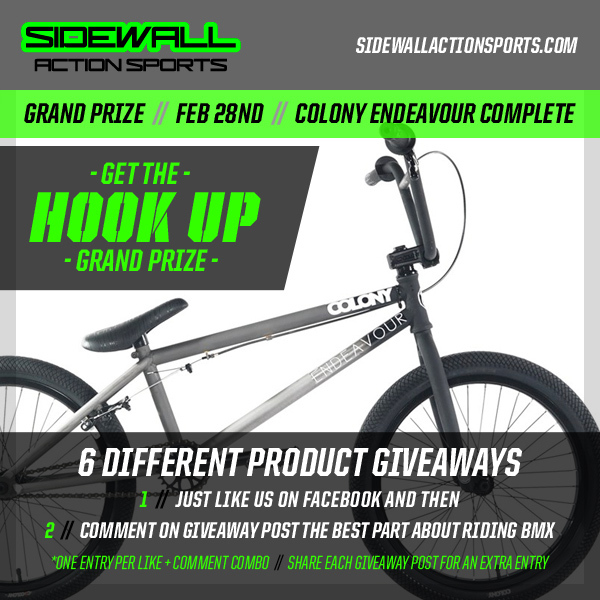 Sidewall Action Sports give away !! 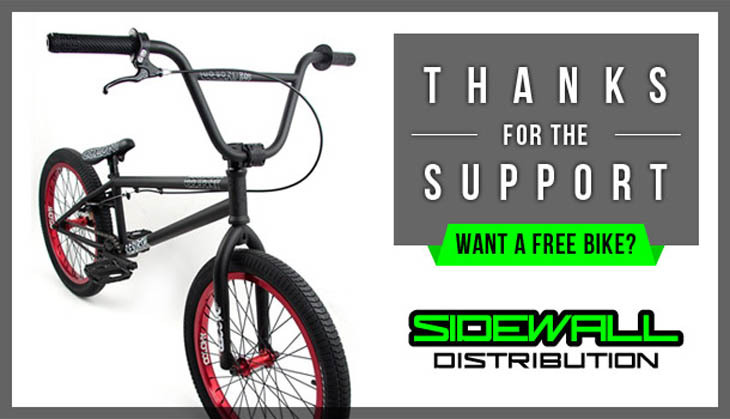 The guys at Sidewall Action Sports in the USA, are doing a FB give away… check it out !! 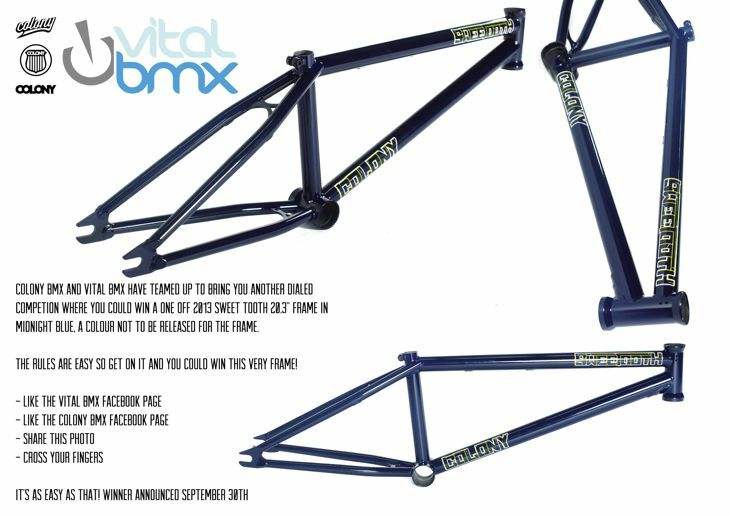 Billy Gecsek was our winner of the 2013 Sweet Tooth Frame promo we did with Vital BMX recently. 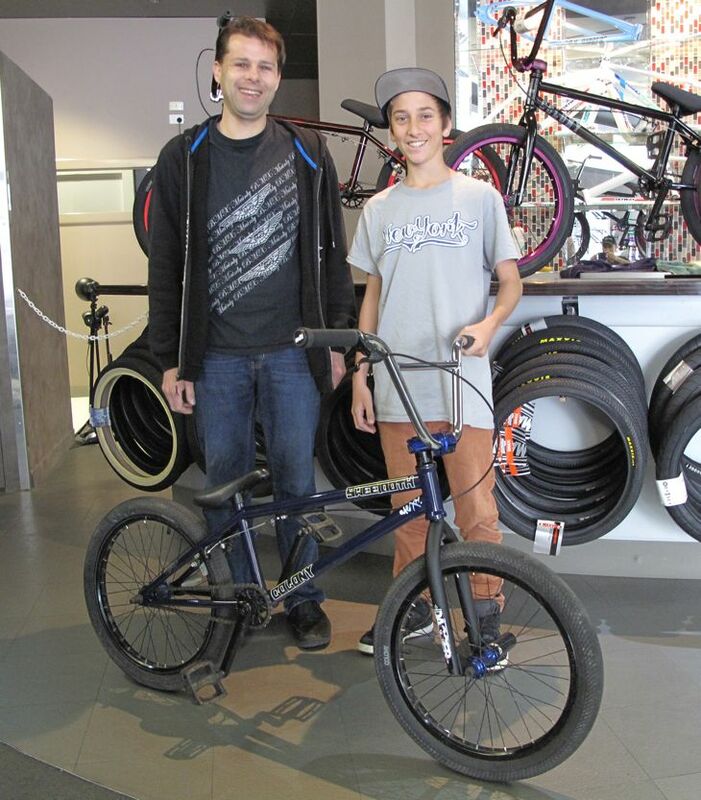 Billy picked up his new frame from the guys at Mainly BMX in Geelong who were nice enough to build it up for him. Alex Hiam even signed the frame as well. To say Billy is stoked is an understatement. Enjoy the new frame Billy !! Colony X Vital contest winner! Thanks to everyone that put in work on Facebook for this, we were stoked on the feedback so we will do it again one day. Also a shout out to Vital BMX for being apart of it. And now for the winner!…. Billy Gecsek! Congrats man, we will contact you to get all the info we need. Vital x Colony giveaway !! Want to win yourself a very special one off 2013 Sweet Tooth 20.3″ frame in Midnight Blue? Well, simply enter the promo below & follow the instructions & this very special frame could be yours. Like both the Vital FB & Colony FB pages as well as share the image below as seen on both FB pages & you are in the running !! It’s the only one in the world so get to it !! 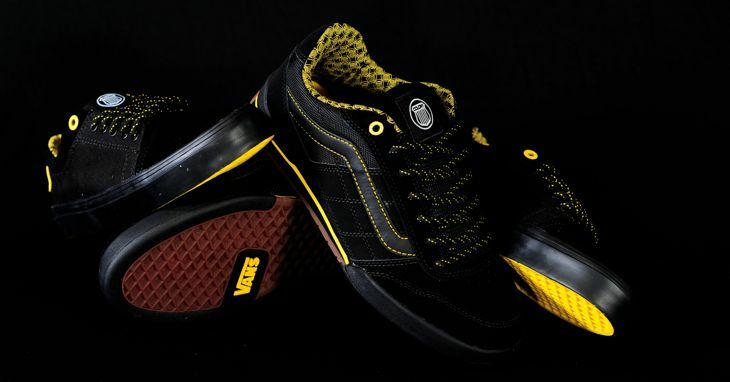 You could be riding just like our main man, Alex Hiam in no time !! Oh, don’t forget to cross your fingers as that will help too… yew !! 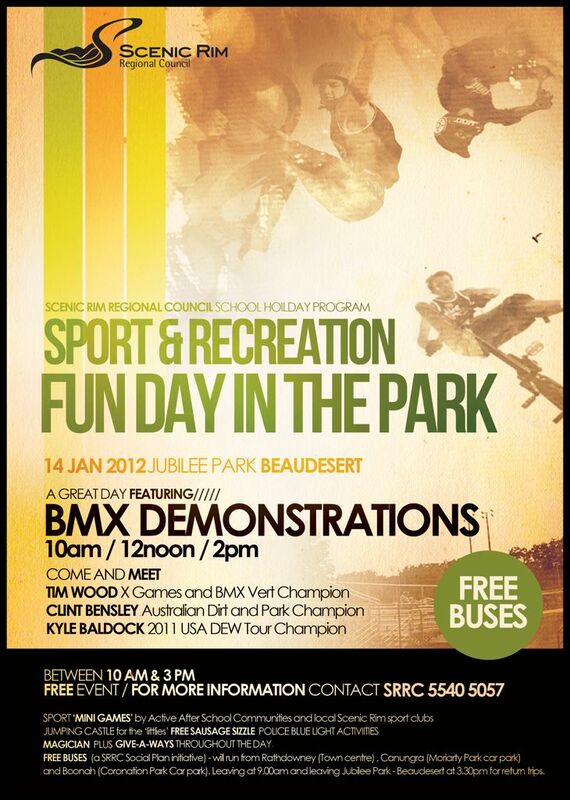 Tim Wood is doing a demo out at Beaudesert on the 14th of January if you’re in the area. He will also have a couple friends with him as well, namely Kyle Baldock & Clint Bensley. 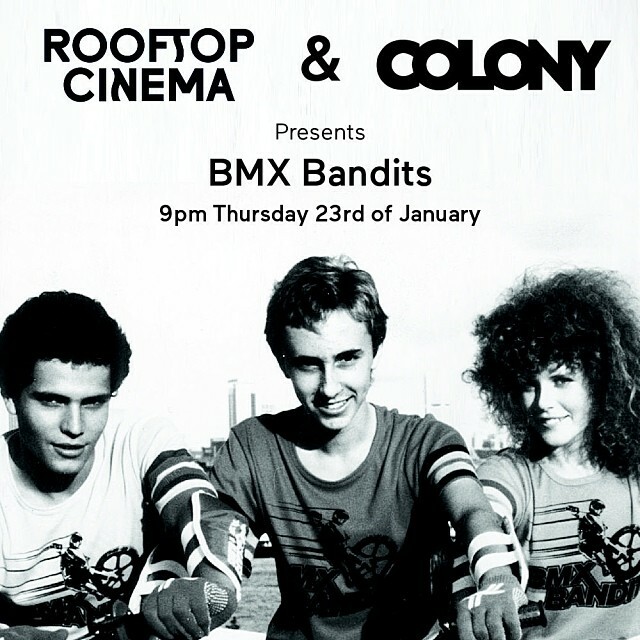 So get yourself along there to check out some good riding, meet the guys & for some giveaways from us here at Colony as well. Our good friends at Sidewall Distribution are having an awesome giveaway where you can win a Rebirth Pro complete bike worth over USD$1,299.00 !! Click here now to check out how to enter.